Cada vez son más los que se atreven a hacerlo y menos los que dudan en su grado de dificultad. Cuando eres corredor, nunca falta el que te pregunta; ¿Cuántos maratones has corrido? y aunque no hayas corrido ninguno le contestes sumando las carreras de cinco, diez y hasta medios maratones. Es cuando corres tu primer maratón que esa numeración vuelve a empezar desde cero. La distancia de los primeros maratones variaba alrededor de los 40 kilómetros y fue hasta los Juegos Olímpicos de 1908 en Londres cuando quedaron fijos los 42 kilómetros y 195 metros (26.2 millas), por una razón muy peculiar. El trazado original no pasaba por el Castillo Windsor, y la reina quería ver a los competidores desde su balcón. Así fue que la largada se corrió hacia ese punto para terminar en el Estadio Olímpico. Personal de la Asociación Atlética de Boston (B.A.A.) asistió a aquel primer maratón en Grecia y querían hacer algo similar en su tierra. La idea no tardó en hacerse realidad y desde 1897 a la fecha, en abril se realiza lo que ahora es el maratón más antiguo del mundo. El único que exige ciertas marcas (a excepción de quienes lo hacen recaudando fondos) para entrar. Realmente ha sido este maratón el que ha marcado la tendencia en la popularidad de la prueba. Al principio era un evento exclusivo para hombres hasta que Kathrine Switzer desafió a los jueces y se convirtió en la primer mujer en participar. Conforme las marcas que se piden para clasificar siguen el maratón se ha vuelto más y más popular entre el mundo de corredores. Sólamente los elites pueden debutar en este evento, el resto de los plebeyos tenemos que pasar por otro antes de entrar a Boston.Tras los bombazos del 2013, la popularidad de esta carrera creció aún más. El maratón es un logro tanto para el que lo acaba en poco más de dos horas para el que lo termina cercano a las seis horas. El maratón te exige que te prepares, al menos que seas ultramaratonista no pienses en poder hacer una de estas pruebas con menos de dos meses de entrenamiento, por lo regular se piensa en cinco meses de preparación. En ninguno de los caso el maratón será un día de campo. En el maratón regularmente son más de 180 minutos donde tu cuerpo puede cambiar. Tu cuerpo normalmente está preparado para un esfuerzo de 32 kilómetros y es ahí donde aunque “sólo faltan diez”, la reserva de glucógeno en tu cuerpo se habrá desvanecido de tu organismo. Esa misma reserva ha sido desarrollada conforme a tus entrenamientos. El maratón es paso a paso. Más que tu cuerpo, es tu mente la que te llevará a la meta pues poco a poco el cuerpo se va apagando. Es importante que estés preparado para retarte a ti mismo especialmente el los últimos diez o quince kilómetros. No hay una frase que funcione y aseguré que lo vas a terminar, serán tus ganas de triunfar las que te harán cruzar la meta y de paso tus pies. No recuerdo a alguien que me diga que sólo corrió un maratón y dejo de hacerlo. Esta prueba tiene algo que por más difícil que sea, invita a quienes la terminaron o no, a regresar. Hay maratones con muchas subidas, otros planos y existen los que cubren la distancia 100% de bajada. A final de cuentas, en todos los casos es la misma distancia, que por cierto todos corremos más que eso pues no vamos en línea recta todo el tiempo. Para poner un ejemplo del crecimiento que ha tenido esta modalidad del atletismo, entre el 2010 y 2014 en Estados Unidos se promedian 500,000 corredores que hayan cruzado la meta de un maratón. Comparandolo con los 225,000 en 1990 es un crecimiento de más de 100%. Con relativa facilidad se llenan las carreras cuyo cupo es de 45,000 y 50,000 participantes como lo son Chicago y Nueva York. 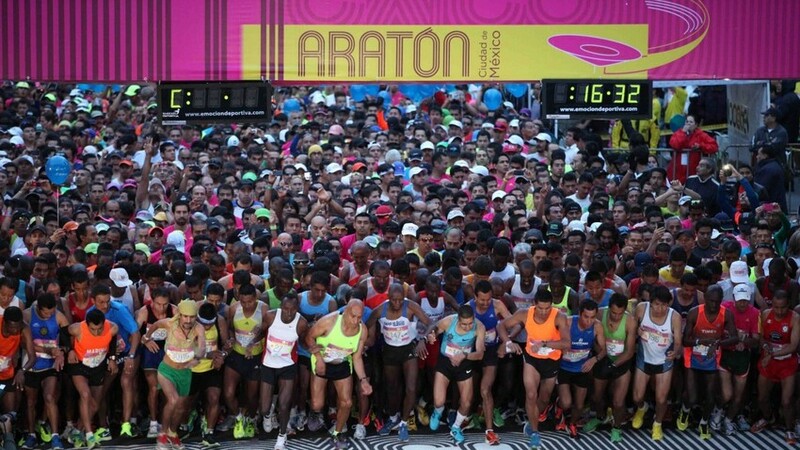 A nivel nacional, el maratón de Mazatlán es bienvenido por la ciudad, ya que crea una derrama económica aproximada a los 66 millones de pesos. El maratón de la Gran Manzana aporta $350 millones de dólares a la ciudad que nunca duerme. Esta comprobado claro que el maratón es la mejor manera de turistear una ciudad. El maratón no va a detener su crecimiento pues es una excelente forma de desafiar los límites del cuerpo humano y es algo que el hombre busca para sentirse realizado por naturaleza. Los Ironmans y los Ultra-Maratónes son bestias aparte. No matter how hard things get, determination will get you to the finish line. I’ve been running for almost 22 years and for the last 14 I started specializing in it. The sport has given me the chance to live in another country, to challenge and learn a lot about myself. Just as there are many things I have accomplished through it there is one I am still missing out on. It took me a while to understand what made running special. Running without chasing a soccer ball is a crazy idea in my country. It makes no sense to the human eye. For this sport it is what it makes you feel inside what makes it special. After overcoming a thousand obstacles while running you will feel accomplished once you get it done. I grew up in a town where the sport was really underrated. I would say a race with 20-30 people was a big one for the most part. I got to know those 20-30 people pretty well as the years went by.Americans are used to racing in courses where streets are closed for hours while a race is going on. In Tampico, Mexico, for a very long time that was unheard of. I raced side by side with drunk drivers, taxis and public transportation buses closing my eyes at almost every intersection hoping not to get hit. My first official race was a 100 meter dash race, and that was long distance for my age group. Then came the 5 K’s, the 10 K’s for which I would usually travel to compete in Mexico City. In 2007 I was living in Canada and decided that by the end of my time there I would try the 13.1 mile race (21 kms.) at the Vancouver Half Marathon. I ran it and I barely remember finishing it, I did make it to the medical tent afterwards and hours later I found out I placed second on my age group on my first half-marathon ever with a 1:32:33 finishing time. I stuck with half-marathons for a long time. To this day, it continues to be my favorite distance. It’s not as long as the marathon but it gives me an edge over middle distance runners that may be quicker the first 6.1 miles but get tired on the second half allowing me to catch up or pull away. My best time is a 1:23:30 so I have made some improvements since Vancouver and hope to one day run it under 1:20:00. Running is a sport where you have to constantly challenge yourself in order to keep it interesting. I knew there would be a day that I had to run a marathon. I always thought that would be after college, but the marathon bug hit me way before that. I was finishing my preparation for the NJCAA Half Marathon National Championship when my mom told me to run the Monterrey Marathon with her by the end of the year. I agreed to the challenge without any idea of what it entitled. I had prepared myself really well for National’s so I was sure I could hold it for another 13.1 miles no problem. Well, I was wrong. The whole idea of running a marathon seems to be messed up by any normal human being. The thing is, runners are not normal. With that being said, I am not normal and just two weeks after competing at the most challenging half marathon ever I was lining up for an even bigger challenge. My goal was to finish, I was aiming to do a good race, keep a good pace, and enjoy the experience. I started at a pace that I was used to for college races (too fast for marathons) and kept it together for 13.1 miles where I almost ran faster than at nationals. But the struggle came on the second half. 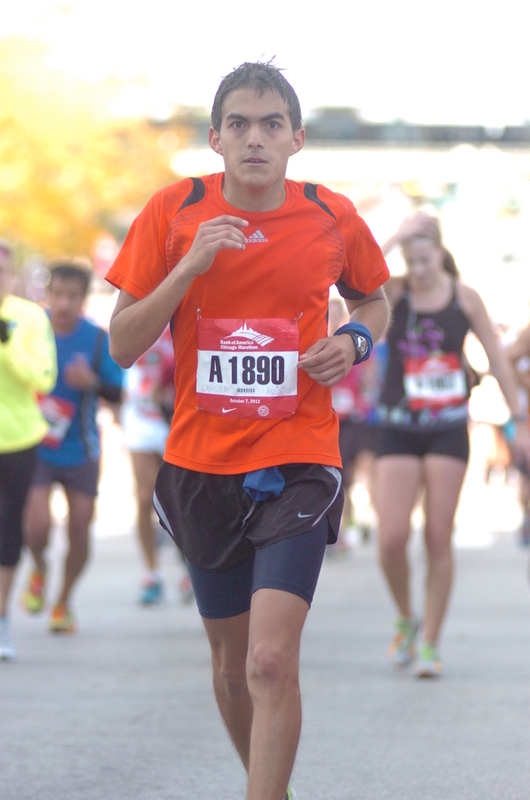 At about mile 17 I felt a cramp during a race for the first time ever. It was so intense I had to stop. I stretched and started running again (I wasn’t going to walk for 13.1 miles). Then came more cramps and more stops. I actually drank coke during the race and that did not help at all, but it sounded like a great idea. All the way up to mile 25 I couldn’t go a mile without feeling a cramp. But with a lot of pride, courage and guts I ran all the way to the finish line and couldn’t be happier when I crossed that finish line in 3:40:00. December 2009 will never be forgotten. I went back to college to compete in indoors less than a month later like if nothing had happened. I was living in Iowa at the time and moved to Texas in August. There I found out about the Dallas Marathon and said why not give it another shot. This was the first time I actually prepared for it. I trained on my own from August to December hoping for a better finish and my first legit shot to qualify for the world’s oldest marathon, the Boston Marathon. I trained well and felt that with a smart race I would be in Boston by next year. It was a great race, the weather really helped my performance and I was feeling great up to mile 20 where my body started shutting down gradually. I made it to the finish with one minor stop and crossed the line in 3 hours 16 minutes. I missed the mark by 6 minutes, I was happy but I felt I had it for the longest time. I was determined to give it another try the following may. I kept a similar training program now focused on endurance. I was my own coach and taking a lot of pride on every result along the way. I raced in Lincoln, Nebraska which gave me a chance to say hi to some friends in the area. It was the smallest marathon I’ve been in and the course was the same for everyone the first 13.1 miles and then marathoners were on their own for the next 13.1. I struggled a bit to find a pace but once I did I got comfortable and ran a very solid marathon. I was on pace for the longest I have ever been. But again the last 3 miles seemed very very long. I was having problems keeping my eyes open due to fatigue. I was also trying not to fall with my legs becoming heavier every step of the way. I went through the mile 26 mark in 3:10:59 seconds. That was the time I needed to make it to Boston, the sad part, I had .2 miles to go. I crossed the finish line in 3:12:00. I had never been more happy and frustrated in my life. My fourth marathon was one to forget. It was in Houston just over six months after barely missing the mark at Lincoln and the day after the Olympic Trials were held in the same place.I was really prepared but when swine-flu hits you just 48 hours before the race the chances of a good performance are almost over before the race begins. I felt horrible by mile 5 and had 21.2 miles to go. Not much to comment here except for the fact that somehow I managed to finish in 3 hours and 41 minutes despite that horrible experience in a fast course. Marathon number 5 has a lot of mixed feelings. I took preparation to a whole new level. I logged more miles than ever during training. I was breaking personal record on many races and speed workouts. I was on fire. The idea of running my first marathon major in a city that meant so much to me was exciting by itself. If there was a time to make it to Boston, it was then. I landed at the Windy City a few days before the race. I got the chance to soak up the whole experience of a city devoted to the race with over 45,000 people and I would be starting in the front. I probably got too excited but tried to keep it together. The day of the race was magical in many ways except for a cramp that at mile 17 pretty much left me without a chance to make it to Boston. I enjoyed the race a lot despite the cramp. 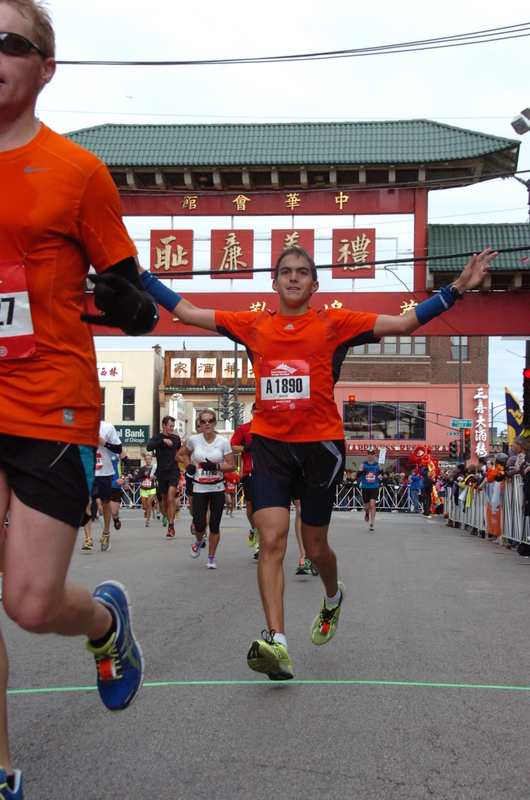 With a 3:27:20 I hope to go back one day because for a runner it hardly gets better than Chicago during a marathon day. Now I’m going on marathon number six. I have chosen the California International Marathon as the event where I will once again try to make it to Boston. There is nothing in my career as a runner that I want more than that. Since the qualifying standard for Boston changed to 3:05 I became obsessed with that number. When I get done with a workout I analyze my pace and compare it to what I need to make it to Boston. It means I have to go at 7:03 for 26.2 miles and around 4:25 per kilometer. I usually chose flat courses when deciding which marathon to do. This time things will get even better with a downhill course and considered by the Boston Athletic Association as one of the top ten courses to punch a ticket to the starting line in Hopkinton. I don’t consider it cheating since I still have to go the 26.2 but a great help when you have to go that fast. Training in altitude should really make training harder but the race easier. As I said before, running has given me a lot of things throughout my life. But the one thing it keeps denying me is the one I want the most. Once I accomplish that I can think about ultras or even Ironmans, but the idea of making it to Boston in 3 hours, five minutes is a priority before moving on. So from now until December 7, 2014 my mind is set on the challenge that takes me to my biggest goal. Nothing would make me happier than crossing the finish line in Sacramento, California earning my way to the Boston Marathon with a 3:05 or better. Once I get there I actually plan to jog it. Estamos a la vuelta de la esquina de los Juegos Olímpicos de la Juventud y realmente en nuestro país lo único que hemos oído es sobre el abanderamiento de la delegación mexicana. Poco se sabe del camino a la clasificación para estos juegos y del viaje de estos jóvenes a Nanjing, China. La única empresa que le ha dedicado un buen espacio a la promoción de quienes nos representarán en China es Claro Sports. Un canal que por el momento sólamente se transmite por internet podemos conocer el perfil de varios de los aztecas que han conseguido su pase a la olimpiada. Aqui vemos a quienes fuera de los reflectores se han ganado el derecho a representar a nuestro país. 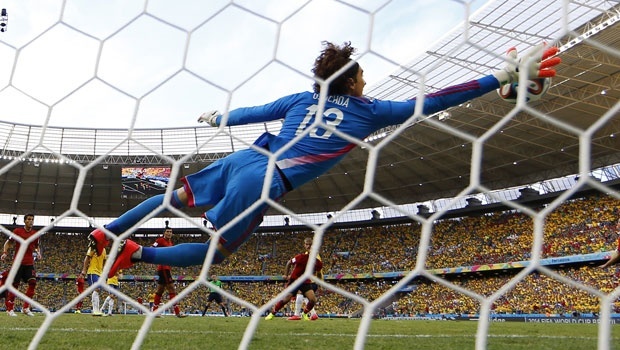 Algunos van por su segunda olimpiada que se realiza cada dos años. Del 16 al 28 de agosto miles de jóvenes representarán a sus países en 28 deportes incluyendo el golf que en el 2016 hará su debut dentro de la justa veraniega en Rio de Janeiro. De México son 78 representantes que a partir de mañana entrarán en acción junto a más de 200 delegaciones donde como siempre el amplio favorito en el medallero son los Estados Unidos. A falta de cifras oficiales se espera que sean más de 3,000 atletas los que participan de este evento. México cuenta con esperanzas de medalla, especialmente en el atletismo donde esta Valeria Ortuño en la caminata y Ricardo Vera en el pentatlón. Este último es considerado por muchos expertos en la disciplina como serio contendiente a una presea. En el tae-kwon-do que por lo regular le da alegrías a nuestro país, Mitzi Carrillo puede ser quien levante la mano por esa disciplina. Hoy Luis Suárez, delantero uruguayo, conoció la decisión final del Tribunal de Arbitraje Deportivo tras su mordida a Giorgio Chiellini en el mundial de Brasil 2014. El verdadero niño malo del fútbol podrá debutar con el Barcelona el lunes ante el León de México cuando ambos equipos disputan el trofeo “Joan Gamper” en el Nou Camp. Este mismo día, en el mismo país desde donde se conoció la decisión (Suiza), volvió a hacerse notar el Luis Suárez del atletismo. El francés Mekhissi Benabbad, una de las máximas figuras de las pruebas de medio fondo había hecho lo más difícil por 2900 metros de la prueba 3000 metros steeplechase. El galo de 29 años de edad tenía la medalla de oro prácticamente colgada en el cuello cuando en los últimos 300 metros de la prueba sacó una buena ventaja sobre quienes venían peleando el segundo lugar. Fue en la recta final del Estadio Letzigrund de Zurich cuando Benabbad se despojó de su playera. Sin pensarlo dos veces, se despojó de su playera que cuenta con dos números de identificación. El niño malo del atletismo cruzó la meta en primer lugar y no dudó en festejar su logro, mejor dicho, seguir el festejo. Pero el daño ya estaba más que claro, y la Federación Española, cuyo atleta Ángel Muyera había finalizado en cuarto protestó el hecho ante la Federación Internacional de Asociaciones de Atletismo (IAAF). La protesta fue evaluada y no tardó en ser aprobada por el organismo rector del atletismo mundial. El autor de semejante error aceptó su culpa en el hecho y dijo a medio europeos que su intención era celebrar la victoria mas no faltarle el respeto a nadie incluyendo sus rivales. Benebbad que es dos veces medallista olímpico y mundial ha demostrado ser un tipo temperamental. En ocasiones anteriores se ha peleado con la mascota del evento y hasta con uno de sus propios compañeros. El galo al parecer ya no participará en los 1500 metros planos tal y como lo tenía previsto al inicio del campeonato. Mientras tanto Ybann Kowal (FRA) se llevó el oro y en su vuelta olímpica le propuso matrimonio a su novia la cual aceptó. Así que dos oros en una sola prueba. En segundo acabó Krystian Zalewski de Polonia y Ángel Muyera se fue del estadio con el bronce. 6 Years Later…Thank You U.S.A.
Running a marathon in a city (Chicago) that means a lot made it that much more special. It was August 5, 2008 when I left behind what I knew, who I knew and anything that seemed familiar to me. I had made the decision I never thought I would make when I was a little kid. Even a year before that day I was dreaming of moving in a different direction. That day I crossed the border, heading into Council Bluffs, Iowa. Out of all 50 states in the United States I seemed to have chosen the least popular one, everyone around me wished me luck in Ohio, or Idaho while I was headed somewhere else. I do like to step away from my comfort zone. This time I had no idea if I would turn back. Six years later I do look back at that day. Even though I am back in Mexico I learned a lot about others but mainly about myself from August 5, 2008 to August 5, 2014. I made the decision based on athletics, but it changed my life. I went in blindfolded, I came out with a different perspective about pretty much everything. Except, mexican food remains as the best one to exist. People ask me, what was it like to live in another country? I divide my six years into several parts. The first part was great because I was excited to discover a new place, a new culture. I believe there were about 5 mexicans at the college I attended my first two years. Thanks to Iowa Western Community College I got the opportunity to live abroad (once again). I was excited to be away from home, but it didn’t take long for the excitement to vanish as I was being tested like never before. Running for a college in the U.S. is no joke no matter how good you are, in my case, how good you think you are. From day one I knew I was in for a huge challenge. The days went by and the results on the track were not pleasing my coach, at races I was not even close to delivering what was expected from me. Nerves and pressure were getting the best out of me. I was pushing my body to an unknown limit, but my mind was not willing to go down the same path, too bad it had to. About two months into this adventure I finally had a good race. It took away lots of pressure, and then came Chicago, where with a better race I proved to myself and others that I had made it over the hump. Not to say things were easy from that point on but I regained confidence and never looked back. That is why Chicago is such an important city for me, it really marked a before and after on my whole adventure. I kept working hard and my times continued to drop. On my second year I made it to the Half-Marathon Nationals. I didn’t win or wasn’t even close but I enjoyed it so much because of everything it meant and how hard it had been to make it there. Running got me into the United States, but education kept me there. After two years at Iowa, where I made a lot of friends in a place where mexicans are a rare species, and winters can hardly get any colder I moved down to the Republic of Texas. Now Denton, Texas was my home. I kept running but on my own time, and I really started to study. It took me a while to get used to everything, Texas has a mind of its own. Remember that I said that in Iowa there were around 5 mexicans in the whole college, here that number was probably the same but per classroom. After a whole year of adaptation I finally got things rolling and focused on journalism like never before. I always knew that if I didn’t make it in life as a runner, I would love to travel the world to talk about sports. In Iowa I had also studied the same thing but things got really serious at the Mayborn School of Journalism. There was no way I could have combined varsity track and journalism. I had a hard time digesting things at the beginning but with practice came great things. I started doing stories about pretty much anything I could think of. The best one yet is when I had the chance to fly on a WW2 airplane for free while recording the whole experience. As I was studying to become a great reporter, I was also preparing myself to run marathons, (ran 4 while I was in Texas) and missed Boston by 75 seconds one time, I was the leader of the Running Club, I usually had one or two jobs to pay for my own expenses and tried to have some kind of social life. It wasn’t easy but it was possible. By this point I was barely going back home to see the family. Coming into my final semester I had been looking for internships all over the place. I applied to almost every place possible. I went home for Christmas without a thing but the day I came back Telemundo called me for an interview, I obviously went and got the internship. 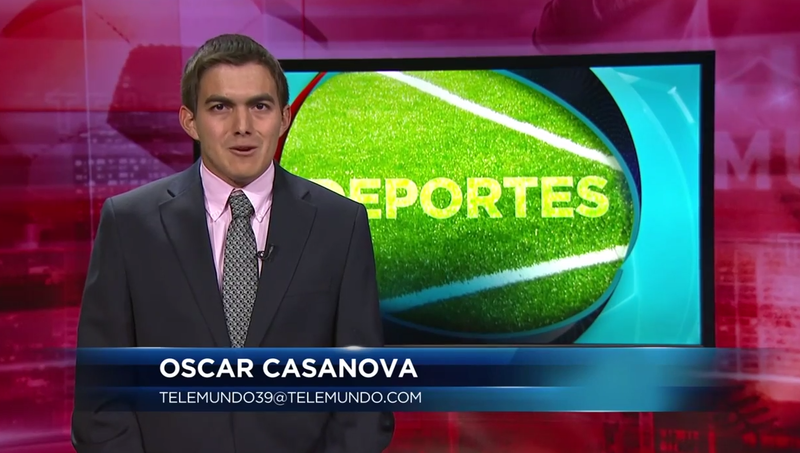 So on the final stretch of my college life I had even one more responsibility which meant that twice a day I had to drive an hour to and from Telemundo plus working on the local newscasts plus a sports show. It was a non-stop race to the finish. I survived and before May 10 (graduation day) I already had two real-world jobs waiting for me. I did celebrate the accomplishment of graduating taking into consideration how hard it had been to get there. But there was not that much time to celebrate as the monday after graduation I was already working on my first assignment for “Al Día”, a local hispanic newspaper. Just when I thought I had seen it and experienced it all I was in for yet another wake up call. I had never worked in a newspaper before, but I was hired for my writing skills. I had never edited a whole tv show before (at Telemundo), but I was hired because they liked how I did things during my internship. I was again under a lot of stress and pressure, I was again close to quitting and packing, but that did not happen. I do not do that, I wasn’t going to that time. It took me close to two months to get things turned around. I had hit rock-bottom, there was only going up from there. I was now being sent out to cover the Cowboys, the Rangers, NASCAR and many other sporting events around the area. I started receiving less criticism and more compliments towards my work. I had pretty much started all over again. The year went by, running was put on hold for a while due to work but I was doing what I liked. I was now ok with dealing with pressure, and was able to deliver 99% of the time. I started looking for a Work Visa Sponsorship but that never came, so I prepared my trip back home for good. May 20, 2014 was the day I took off, but hopefully I get a chance to go back. Not necessarily to Dallas or Iowa, where I made great memories but anywhere to a country that pushed me to my limits over and over again. A place where I discovered how hard life can be when you’re on your own but also how good it feels to get back up. That is so true. I had great moments but I also fought huge battles against myself to make things work. I learned a lot about myself and what I am capable of, something I’m quite sure wouldn’t have happened if I stayed at home and watched life go by. I lived some of the best experiences a guy at 25 could have wanted. My job as a reporter was just getting started in the DFW area, but I had the experiences of a veteran. This is just the start of a really big dream.